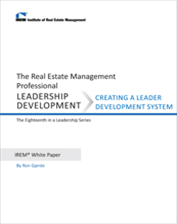 IREM Leadership books, courses, forms, and webinars will help you expand your skill set and provide resources for every step of your career development. No matter your level of experience and expertise. In today’s business environment, the ability to create loyal, lasting relationships is crucial. 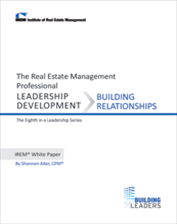 This IREM white paper on Relationship Building will help you do just that—become a leader who is able to garner trust and respect. Your clients want to know that you value their business, and your employees want to know that you value the work they do. Because trust and respect are not automatic, it’s important to know how to lay the foundation for fostering relationships on an ongoing basis. This white paper will give you the tips and tools you’ll need to win new business and keep what you’ve got, which centers on your ability to earn trust, credibility, and respect. A common mistake leaders often make is spending most of their time trying to develop their poorest performers— and overlooking their top performers. Studies show that high performers produce 20–50% more than average employees. It’s easy for most managers to tell their employees what to do and address their poor performance. However, it’s a challenge to actually develop effective feedback and coaching for your employees. This white paper—the 7th white paper in the IREM leadership series—will help you understand some the most important and valuable skills that any leader should have when it comes to coaching and helping others develop their skills. Coaching can have a considerable impact if it is targeted at high performers, or at least those with high potential. Even high performers can improve with the proper coaching. Download this white paper to learn the fundamental difference between managing and coaching and become a more effective leader. 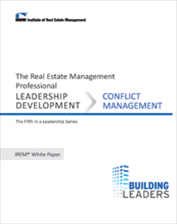 The IREM Job Analysis identifies conflict management as one of the critical leadership competencies required of property and asset managers. One of the common myths is that conflict is inherently bad and should be minimized or avoided at all costs. On the contrary, properly managed conflict can lead to greater innovation, performance, and even improved cohesion within a team—creating an environment for open and honest discussions. Of course, if it’s not managed properly, conflict can also have the opposite results. One of the best tactics for managing conflict is known as mental jiujitsu—avoid pitting your strength against your opponent’s directly; instead, use your skill to step aside and turn their strength to your ends. In other words, absorb the energy of your opponent and use it to manage their behavior. When they assert their positions, do not reject them: Ask them to explain their position. How does it achieve their interests (helping to learn more about their real interest)? Why do they think it is a fair and reasonable solution? When they attack your ideas, don’t defend them: Ask them to explain why your ideas won’t help achieve their interests. Ask them to help you understand why they don’t think it’s a fair and reasonable solution. When they attack you, don’t counterattack: Sidestep their attack and deflect it against the problem. If someone says, “You’re just being selfish about this,” respond by saying “Well, let’s look at the problems and maybe it will help me understand why you think I’m being selfish.” If someone is using unfair tactics, simply call them out on it, “It sounds like you can’t make a final decision on this. Perhaps I should talk to the person who can, or postpone our discussion until you get more direction.” Generally, when the other person knows that you know an unfair tactic is being used, they will stop using it. If you like this white paper, you may be interested in the other papers in this series. Click here to access the other white papers in the series. The need for leaders at all levels is one of the top critical issues identified in the Global Human Capital Trends 2014 survey. According to the survey, leadership remains the number-one talent issue facing all organizations. Creativity is what elevates us to success. It’s what separates the winners from the runners-up. Most importantly it adds excitement and vibrancy to the workplace. This White Paper on creativity will teach you how to explore creativity as it is described in a unique question-and-answer format. Wouldn’t it be nice to have enough time to complete all your work? Maybe even have a little free time to work on those new projects you have been putting off? 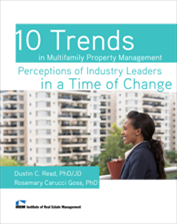 As real estate management pro­fessionals move up the career ladder, they have less time to actually manage properties. Instead, they have to manage the people who manage the properties. Delegating responsibility is one of the toughest competencies for a new supervisor (and for a lot of experienced supervisors) to master. It is one of the key competencies that real estate management professionals have identified as being critical for success. Research suggests that leaders who delegate authority more frequently often have higher performing businesses. This White Paper also provides some interesting insights into why some supervisors tend to have a difficult time in delegating work to their subordinates. The fears of giving up control or prestige are just a few of these reasons. After pushing through your personal obstacles and becoming more self-aware, this White Paper will help you free up more time so that you can focus on more higher-lever strategic planning. Delegating responsibility will help you build engagement and motivation among your staff members, thus strengthening your organization overall. Download this PDF to help you strengthen your leadership skills and simultaneously help others strengthen their skills as you delegate tasks. 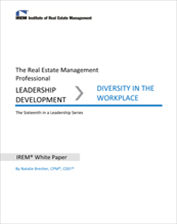 Having a diverse workforce is crucial for organizations to stay current and forward thinking. At times, diversity and inclusion initiatives are steps to create fairness in the workplace for groups that are protected legally or are underrepresented. Having a diverse workforce enables your company to have both analytical and creative thinkers. Having this diverse set of thinkers creates a balanced harmony and sense of productivity for your business.